Wow, this Monday has come around fast!! Who secretly thinks the vest makes me look like a caveman but is too nice to say so. I love fur vests on other people, I just wasn't sure about the look on me. So rather than investing a lot of money in something I wasn't sure about, I decided to make one. Let me start of by saying the fact that this stuff is called "fun fur" suggests the manufacturer had a wicked sense of humour. It was not fun to sew with. It was messy and fluffy and stiff and messy... oh and did I mention the mess?! To make a pattern I simply traced around an existing vest. I added pockets to my vest, because I love pockets in everything! It is fully lined and after scouring the internet I came across this really helpful tutorial for construction. I am happy with the end result. 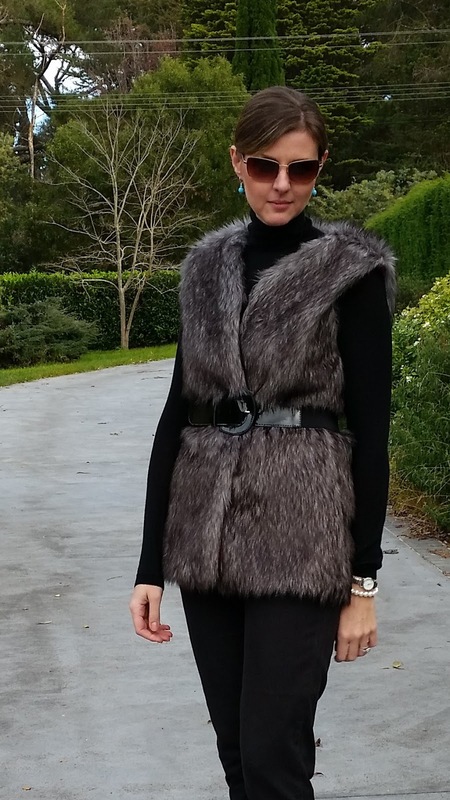 I like wearing it with a belt to give some waist definition and it keeps me warmer than wearing it open. Despite the massive amount of mess - this stuff flies everywhere while cutting & sewing! - it was a quick and fairly simple project which only cost me $23 as I already had the lining. 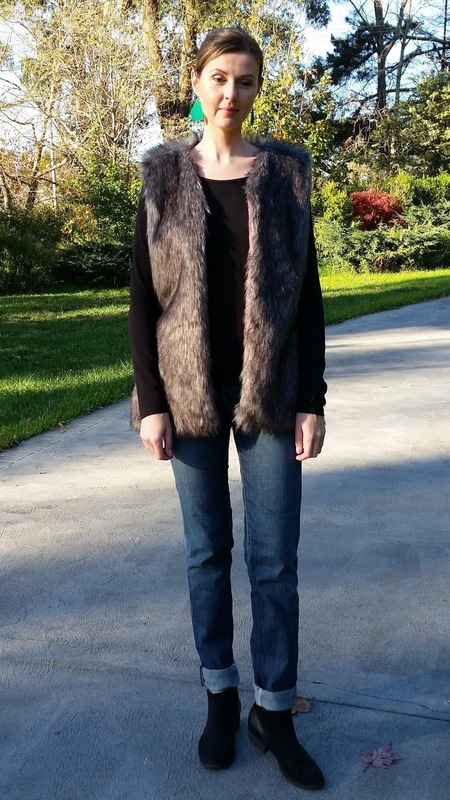 Have you sewn with faux fur? Super cute! The vest looks great belted! Nice job! Wow, you are so very clever! I so wish I could sew. It looks fab and for $23 a real bargain. I haven't thought of wearing mine belted. I will give it a try. Found you over @Flat Bum Mum. Thanks so much for reading & taking the time to comment Sarah! Anyone can sew, it just takes a little practice (and a sewing machine is helpful!) however I don't suggest you start with "fun fur"... it's not fun!! You did an amazing job! Love this! Funny about the fur not being fun to work with. I can only imagine! You look fab in this look by the way. 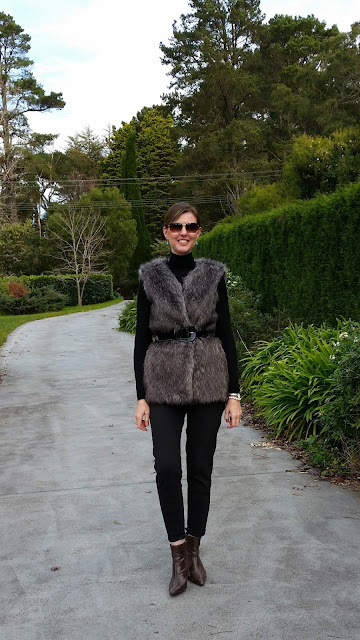 I love this belted vest on you! And pockets! You now don't need to buy one, your self sewn one is so much better! I can imagine how tough it is to cut the fabric without the fur going everywhere. You did a great job!